Bob's latest release of WinPE 10 64-bit (v3.1) can now work either as a .ISO file in E2B or as a .imgPTN file. If you boot it as an ISO, it will auto-detect the TheOven_Startup.cmd (if present on your E2B drive) and run PEStartup (see here for details). Tip: End the filename with the letter Q to suppress E2B's QRUN prompt - e.g. Bob_Omb's_v3.1_64q.iso. Do not use spaces in the filename because WinBuilder ISOs don't work correctly if there is a space in the name. The file extension must be .iso. Instead, you can create a .txt file using the \_ISO\TXT_Maker.exe file. This allows you to have spaces in the menu entry (e.g. 'Bob Omb's WinPE10 64-bit'). The ISO must not have any spaces and must end in .iso. You can also use the '64-bit' option in TXT_Maker so that the ISO will only be listed in the menu if run on a 64-bit system. If you convert the ISO to a FAT32 .imgPTN file, you will be able to MBR or UEFI-boot to it and also have some persistence. I suggest you increase the suggested size when you make the .imgPTN file, to allow you to add your own portable apps, shortcuts, etc. Drive Y: will be the E2B USB drive once it has booted to the Desktop. Now you can easily save Start Menu shortcuts, Registry Keys, and portable apps to your USB. this each time you make changes. in this folder as you like. If you want to modify Bob's Desktop/wallpaper using PEStartup, you should copy the files onto the E2B drive after you have switched to the .imgPTN image. This allows you to add any more PortableApps that you want as well as make other changes. Personally, I like to have lots of shortcuts on the Desktop so I don't have to hunt through the 3-layer deep Start menu to find what I want. More details about PEStartup are here. 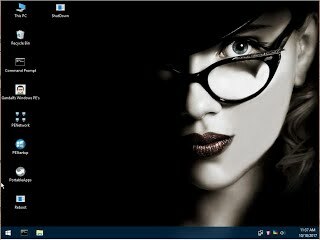 A ready-made download which changes the wallpaper and adds a few shortcuts to the Desktop (see below) is here. Screenshot is actually Gandalf's PE! Tip: Add '64' to the file extension so that it will not be listed on a 32-bit computer (BobOmb31.imgPTNauto64).